The world’s first fresh food robot, Sally, debuts in four hospitals. Silicon Valley-based food robotics company Chowbotics created Sally the Robot to serve nutritious food anytime, anywhere. By partnering with Chowbotics to bring Sally on campus, hospitals around the country are expanding foodservice options, offering vibrant, forward-thinking meals made on-demand that can be personalized to meet each individual’s dietary needs. Sally offers thousands of custom meal options from any combination of up to 22 ingredients, in addition to chef-crafted, pre-programmed salads, grain bowls, and breakfast bowls. Users can fine-tune the calorie total by adding or subtracting ingredients, as well as view full nutritional details for each selection. Sally’s proprietary technology also reduces the risk of foodborne illness and cross-contamination, as ingredients are separated by canisters, replenished on a regular basis, and contained within the robot. Sally is now serving fresh food at the University of Arkansas for Medical Sciences (UAMS) in Little Rock, Ark., IU Health Bloomington Hospital in Bloomington, Ind., and Erlanger Children’s Hospital Kennedy Outpatient Center in Chattanooga, Tenn.
At UAMS, the largest public employer in the state with more than 10,000 employees, the robot is available 24 hours a day and averages 65 sales per day. Chancellor Cam Patterson, M.D., MBA, knew immediately after seeing a demonstration that it was something he wanted visitors and employees to be able to have. “Sally’s fresh salads are an ideal alternative to a salad bar and fit perfectly with UAMS’ mission to promote a healthier lifestyle,” Patterson said. Josh Patton, owner of the Choo Choo Cafe at Erlanger Children’s Hospital Kennedy Outpatient Center, sees the robot as a space-saving solution. 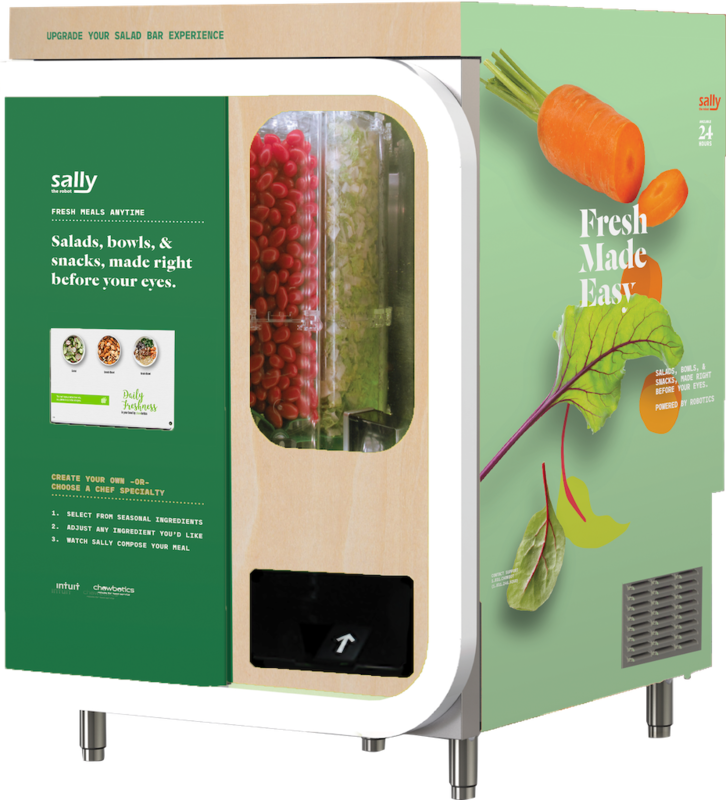 "We have a limited amount of space, and Sally the Robot ensures we can offer customized, fresh salads,” Patton said. The robot at IU Health Bloomington Hospital is located in the main lobby of the hospital, between outpatient surgery and the emergency department. "Since implementing Sally the Robot, many team members and families have expressed their appreciation for the ease of access,” Wendy Hernandez, IU Health VP of Professional and Support Services said. Sally also debuted at North Oaks Medical Center in Hammond, La. March 4 as part of a partnership with popular local chain, The Salad Station. By utilizing Sally, The Salad Station is able to expand its footprint by offering local, seasonal salads beyond its brick-and-mortar locations.